Welcome to Flekkefjordbanen and our railway biking trips. A perfect activity whether you`re are a family, a group of friends for a teambuilding day with your colleagues. The bicycles are custom made and specially designed for comfortable and safe cycling on railway tracks. It`s a tandem bike, and there`s room for two people cycling, and as well as one passenger, as shown in the illustration on top. The bikes are versatile handy and flexible and can take wheelchairs and even child seats. The trip starts at Flekkefjord station. You will experience breathtaking sceneries and seventeen tunnels on your journey. The trip starts off from Flekkefjord station, your first encounter, is a dark tunnel leading you out of Flekkefjord city. You will throughout the entire trip, pass several stops, that have been well preserved by the volunteer organisation “Friends of Flekkefjordbanen”. The stone work and the tunnels along the railway are particularly impressive. The entire trip offers beautiful sceneries. At Flikkeid you can see a beautiful well preserved water tower used to fill the old locomotives with water. Flikkeid is a good spot for a break and a little snack. Travelling onwards from Flikkeid you`ll be passing the most beautiful views at Flekkefjordbanen. You`ll be cycling alongside the Lundevatnet, a beautiful fjord., before submerging into the longest tunnel on this trip with a length of 1200 metres. At the end of the fjord, you`ll be cycling across a track exchanger. Pass gently and everything will be fine. You are now at Sirnes and almost at the last stop, Bakkekleivi. The last part is 2000 metres long and you have an option to turn around here and skip, the last part. The whole stretch includes seventeen tunnels, with the longest being 1200 metres. There is no light inside. You may buy head lamps at our station, in case you haven`t brought your own. We recommend warm clothes. The tunnels can be chilly. Bike helmets and reflective vests are mandatory, and are included in the rental price. We recommend headlamps or flash lights for the tunnels. If you follow the safety instructions, railway bicycling is a perfectly safe activity. In 1894, it was decided to build the railway between Flekkefjord and Egersund further west. The construction work started in 1897, and the railway was opened in 1904, as a narrow-gauge railway. The construction took seven years, and required the lives of seven workers. For a period, the railroad tracks from Flekkefjord till Tronvika consisted of dual gauge railway tracks. 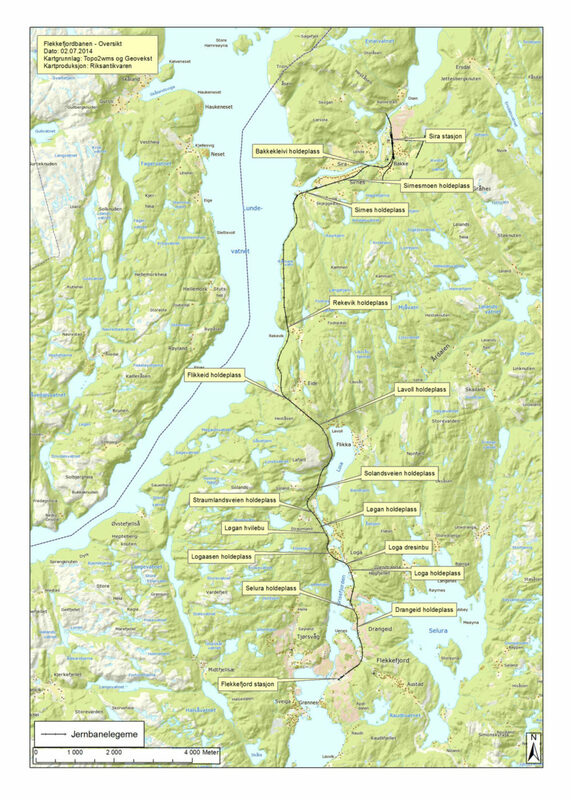 In this period, you could drive narrow-gauge trains and standard gauge trains so they could transport equipment to Sørlandsbanen, from Flekkefjord harbour. In 1944, the railway was rebuilt into a standard gauge railway, and connected with Sørlandsbanen at Sira station. Simultaneously the stretch between Sirnes and Tronvika was shut down. Today this stretch is part of the European road network E39. The Flekkefjordbanen was finally shut down 31.12.1990. » Read more at Flekkefjordbanens venner.